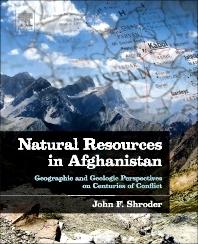 Natural Resources in Afghanistan: Geographic and Geologic Perspectives on Centuries of Conflict details Afghanistan's physical geography — namely climate, soils, vegetation, water, hazards, and basic geologic background and terrain landforms — together with details of its rich natural resources, ethnic problems, and relevant past histories. The book couples these details with the challenges of environmental degradation and new environmental management and protection, all of which are considered finally in both pessimistic and optimistic modes. The reader comes away with a nuanced understanding of the issues that are likely to have great affect for this pivotal region of the world for decades to come. With an estimated $1-3 trillion dollars of ore in the ground, and multiple cross-reinforcing cancellations of big Asian power machinations (China, India, Iran, Pakistan), Afghanistan has an opportunity to gain more economic independence. At the same time, however, historic forces of negativity also pull it back toward the chaos and uncertainty that has defined the country and constrained its economic progress for decades. Primary audience includes geologists, geomorphologists, and mineralogists. Government and military officials comprise the secondary audience. Others include the United Nations, World Bank, embassy and aid organizations. Part II. Introduction to Resources: Bones of Contention or Solutions to Interminable War? Kabul be-zar bashad, be-barf ne-bashad!